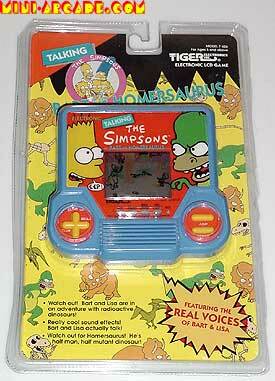 Bart vs. Homersaurus is a LCD game released in 1994 by Tiger Electronics, Inc..
"Bart's at the museum for a school assignment, but it's built on a nuclear waste dump and the dinos have come to life! The worst one is half Homer, half mutant dinosaur! Lisa is being her usual sisterly self - she's on the side of the dinosaurs and uses a water hose to try and flush Bart away!" Modified on May 22, 2012, at 11:04.